CHFWS has a big capacity and high head. Because of complete hydraulic balance, CHFWS has a excellent reliability. Horizontal split construction helps easy maintenance without disturbing motor and piping. CHFWS is designed for easy operation with high efficiency and low NPSH. lntake and transfer of sea water at Power Plant. Water intake, transfer and pressurization at Water Supply/Drainage Plant. Water intake and transfer at River. Liquid circulation and transfer at Several Industries. 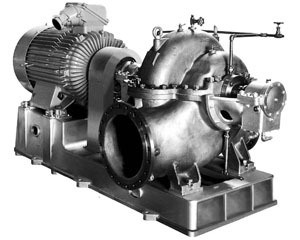 For cast-iron material the pump model is CHFW. Water jacketed shaft seal is available when pumping temperature is 80ºC∼120ºC. Water jacketed shaft seal + Bearing housing is available when pumping temperature is 120ºC∼200ºC. b. In addition, a special mechanical seal may be installed on request.